From the clarins laboratories-a new sun care sensation for body and hair! 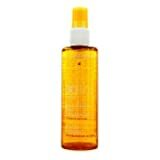 this spf 30 dry oil spray-formulated with organic indonesian nyamplung oil-protects skin and hair from the drying effects of sun, salt water and chlorine. Senna extract defends from uv damage. Plane tree extract fights free radicals. Aloe vera soothes and softens. Promotes a rich, healthy-looking tan. •protects body and hair with spf 30 sun filters and extracts of gold cob, sycamore and aloe vera •nourishes and beautifies skin and hair with organic indonesian nyamplung oil •enhances a tan and leaves the skin satin-smooth •water- and sweat-resistant •dry oil; no greasy after feel dermatologist-tested. Water-resistant.